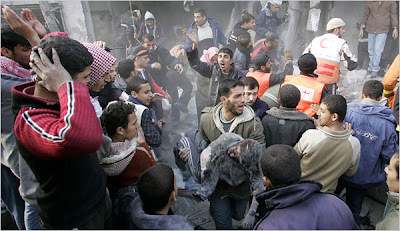 Israel has refused to cease its attacks on Gaza despite the massive humanitarian crisis unfolding there. Gaza civilians who had already been deprived of food, medicine and fuel for months before the attacks, are now overwhelmed by the carnage inflicted on them by Israel. Gaza hospitals are unable to cope with the overwhelming numbers of injured people flooding the hospital. Hospital staff are overworked, and they also operate in fear of their own lives as even Gaza medical personnel are not safe from the Israelis bombs. Israelis are bombing ambulances. They have no way of alleviating the pain of those suffering, as they lack much-needed medical supplies. Not every injured Gazan is able to make it to the hospital anyway, some prefering to stay home and suffer for fear of being bombed on route to hospitals, or as an NYT article put it:"risk driving through streets of pummeled buildings and concrete shards". But Israel's foreign minister, Tzipi Livni, has audaciously claimed that "there is no humanitarian crisis and therefore there is no need for a humanitarian truce". Israel claimed initially that their attacks were a response to Hamas's act of sending rockets into Israel after the six-month cease-fire ended on Dec. 19. They claimed that their primary mission in the attacks is to stop Hamas from firing rockets into civilian areas of Israel. But anyone who has been following the developments, know that Israel prevented open border crossings at Gaza to the detriment of its civilian population for long months. Richard Falk, the UN special rapporteur on the human rights situation in the Palestinian territories, said in a statement that considering "the cruelty and unlawfulness of the Gaza blockade ... it would seem mandatory for the International Criminal Court to investigate the situation, and determine whether the Israeli civilian leaders and military commanders responsible for the Gaza siege should be indicted and prosecuted for violations of international criminal law." He added: "Some governments of the world are complicit by continuing their support politically and economically for Israel's punitive approach." Israel have tried their utmost since Hamas became the elected government in Gaza to weaken Hamas' position, prevent them from governing and providing for their people. Israel's main intention all along has been to topple Hamas, and futher weaken Gazans so that they remain unrepresented by a government that actually advocates on their behalf. The lack of response from the world has only solidified Israel's murdereous intent. Israel will continue until Gaza is sufficiently decimated. Israel does not want to deal with anyone on an *equal* basis, much less the Palestinians. The only peace acceptable to Israel would be the one dictated to by Israel. 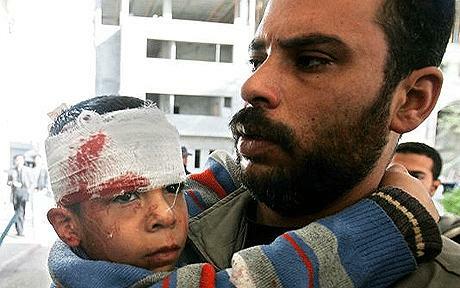 Meanwhile, the weak, vulnerable and the most innocent of the Gaza population - the children - suffer. "But there were several children in another intensive care unit on Tuesday. Among them was Ismael Hamdan, 8, who had severe brain damage as well as two broken legs, according to a doctor there. Earlier that day, two of his sisters, Lama, 5, and Hayya, 12, were killed. Ismael, before he passed away. Dec. 31, 2008. These Palestinian children do not have the chance to live a proper childhood that so many of us elsewhere take for granted. Do they not have the right to grow up, to exist? If Palestinian children are not caught in the crossfire first, they are forced to grow up faster than they should. The excerpted NYT news report below has a journalist obtaining comments from two young Palestinian boys on the political situation, as if they were grown-ups. How warped is that? Approach two Israeli boys of that same age and you will see the vast difference - Israeli boys would be cocooned safely in their homes, coddled by their parents, and armed with video games as boys that age usually are. Palestinian boys are forced to defend themselves with stones. That is unjust. At the Shuafat refugee camp on the northern outskirts of Jerusalem on Sunday, masked Palestinian youths burned tires and used slingshots to hurl stones at Israeli soldiers. Mohammed, 13, predicted bloody Hamas reprisals. “Hamas will be the one that will bomb green Egged buses, and we will go back to the way it was,” he said, referring to the Israeli bus carrier that is often a target of suicide bombers. Others were more doubtful. Ahmad, 14, said he supported “neither one nor the other,” complaining that Hamas and Fatah spent too much time fighting each other instead of working for Palestinian unity. Dead Palestinian Child Carried. Jan. 1, 2009. Israel is always adamant that everyone acknowledge their "right to exist". But one only has rights, if one is responsible. When a murderer attacks with impunity, he is deemed a danger to society. When he is caught, his rights are taken away, and he is locked up. In some other societies, he is even put to death. When Israel has reneged upon its responsibilities to be a responsible nation in the world, time and time again, one has to ask if it has come time for Israel's rights to be taken away. No longer can I say with my conscience intact that present day Israel has the right to exist, in the manner it has been existing. I do not mean all Israelis should be put away in jails, or murdered. Rather perhaps a superpower should occupy Israel (much like the way US had occupied Iraq), disarm the state, and force it into compliance - that is, force it to accept a just two-state solution so that finally the Palestinians can have their turn to exist and live the good life that has been denied them for too long. But for the first time in my life, I think I can fully appreciate it when people state that Israel has no right to exist - certainly, Israel as it is today has no right to exist - it is nothing more than a murderous thug. And murderous thugs should be restrained. If enough of us in this world are vocal enough about our abhorence towards Israel's acts, then perhaps our leaders would be compelled to restrain Israel, and help it change its behavior.